The horse corral has finally been completed for this year’s horseback riding activity. We have partnered with True Vine Equestrian Center to provide horseback riding for both of the grade school camp sessions. Riding will be available as an activity class for extended times of learning and also as a recreational activity during free time for campers. Free time riding will take place in this corral that was just completed. Classes will be able to participate in trail rides around the camp property. We are excited about this new opportunity. A special thanks to the men from man camp who were able to help out with the construction of this corral. If you missed Man Camp this past weekend, you missed out! This is quite possibly the manliest weekend you have ever experienced. 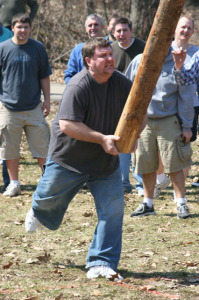 The weekend included a Miracle Man competition with a Scottish caber toss, paintball, zip line, trap shooting, and much more. 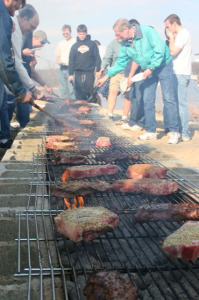 The highlight was our 30 foot long grill in which every man hand selected and grilled their own steak! Don’t miss out on this awesome retreat next year.